SBPLI FIRST Long Island students, educators and parents await the announcement of this year’s challenge at the FIRST Robotics Competition season kickoff at LIU Post Tilles Center on January 5. 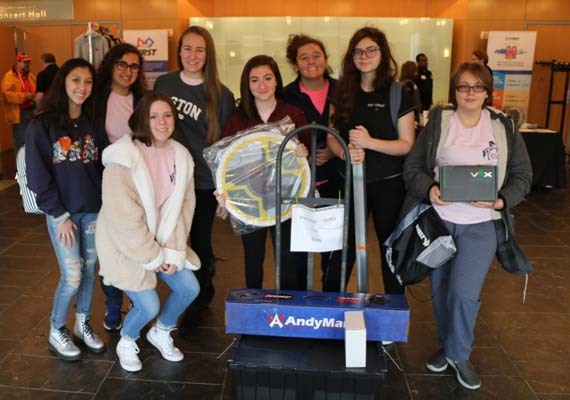 [Brookville, New York] — The Tilles Center at LIU Post was abuzz with anticipation on January 5 as students, educators and families from across Long Island joined together for the unveiling of the 2019 FIRST® (For the Recognition of Science and Technology) Robotics Competition challenge, “DESTINATION: DEEP SPACESM” Presented by The Boeing Company. In DESTINATION: DEEP SPACE Presented by The Boeing Company, alliances must deal with unpredictable terrain and weather patterns while attempting to collect as many cargo pods as possible during a two-and-a-half-minute match. Because of unforeseen factors during the match, remote robot operation is essential to their mission on the planet. 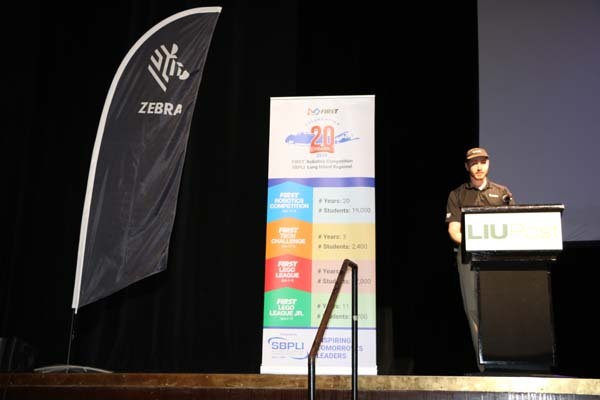 This year’s Kick-Off was especially exciting because 2019 marks the 20th anniversary of the SBPLI Long Island Regional FIRST Robotics Competition. Throughout the season, FIRST programs will commemorate and honor the history of the program on Long Island and its lasting impact. 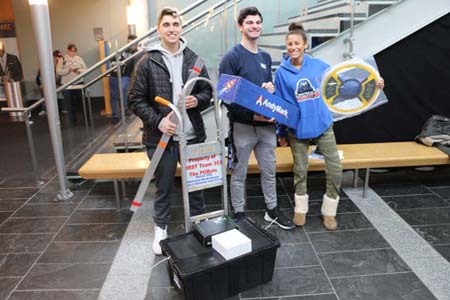 Presented by School-Business Partnerships of Long Island (SBPLI), also known as FIRST Long Island, this annual event served as the official Kick-Off of the 2019 FIRST Long Island season and included a live broadcast of the game reveal direct to the Tilles Center. 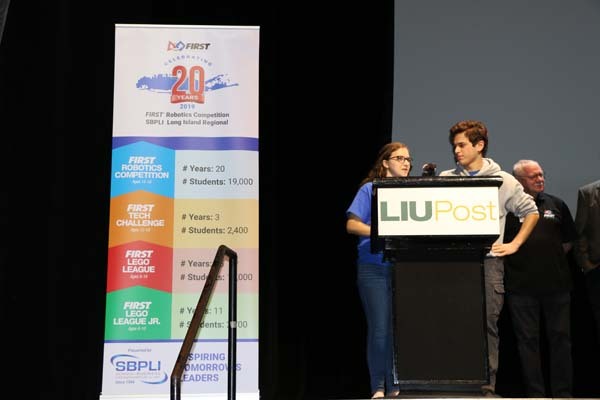 Hundreds of eager FIRST Long Island students and their parents and coaches listened with rapt attention as FIRST Founder Dean Kamen, FIRST Executive Advisory Board Co-Chair Woodie Flowers and FIRST President Donald Bossi discussed the program as well as the 2019 theme and objective. “We are here to make sure you have the tools to cure cancer, build clean energy supplies, and make water, food, and cybersecurity available worldwide — to make the world a better, healthier place,” said Dean Kamen, president of DEKA Research & Development and founder of FIRST. Before the broadcast, members of SBPLI-FIRST Long Island, sponsors and alumni addressed the crowd, including FIRST Robotics Competition Co-Director Larry Toonkel, Executive Director Bertram Dittmar and Board Members Michael Canders and Jeffrey Stern. 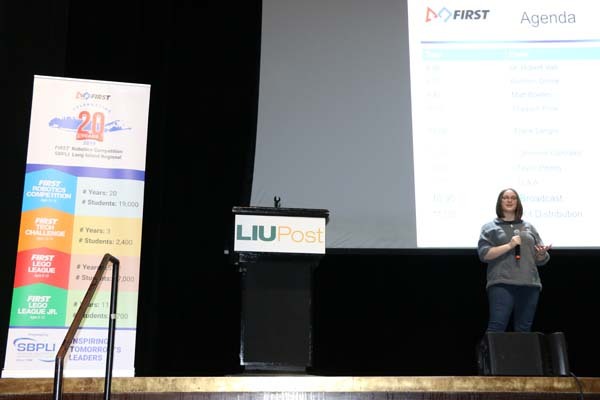 The presentation featured guest speakers from FESTO, Cradle of Aviation, Zebra Technologies and alticeUSA — all sponsors of the SBPLI Long Island Regional FIRST Robotics Competition. 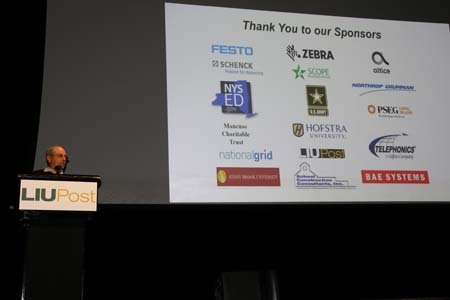 “This Kick-Off event was a success from all perspectives,” said David Seinfeld, LIU Post Director of School Planning and Partnerships. “The students were inspirational. Their energy for the program, their honor for each other and their respect for the university’s facilities was truly outstanding.” LIU Post offers full scholarships to high school seniors with a 1300+ (28 ACT equivalent) and a 90+ GPA and is encouraging students from Long Island teams participating in the FIRST Robotics Competition to apply. FIRST isn’t limited to Long Island; nearly 3,800 teams from all over the world came together as a community to share in the excitement of seeing the new game unveiled and will draw on this enthusiasm during the six-week build period that is available. During this time, all FIRST students will be asked to design, build, test and update their robots before the start of the 2019 season, which includes more than 170 Regional and District events beginning late February. These events measure the effectiveness of each robot’s design and control, the power of teamwork and the determination of participating students not only to win, but to learn and have fun.